Tourist-Channel Slovakia - Veľký Blh Tourist-Channel Slovakia: New homepage! The village of Veľký Blh has always been the centre of Blžská valley in the region of Gemer. The first written reference of Veľký Blh dates from 1324. Many bronze objects such as buckles, axes and tools were found in the area of Veľký Blh. They all date from the Bronze Age which reflects the early settlement of this area. The ruin of the Middle Ages Blžský castle is situated above the village. 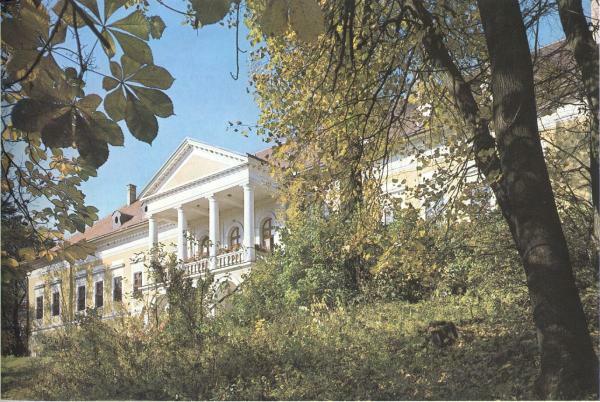 The castle was owned by many powerful family clans such as family of Balogh, Szécsi, Koháry and Wesseleny. The history of the ruin is also connected with Bulgarian prince Coburg and Hungarian poet István Gyongyosi whose famous baroque piece was "Marssal társalkodó Muranyi Vénusz". The ruin is surrounded by forest called "Čierna obora" which is now animal reserve gathering many species of animals such as roes, boars, birds etc. The unique feature of this reserve is a 300-year-old oak tree which belonged to the Queen of the castle Maria Szécsiova. There is also a huge sequoia tree (Sequoiadenderon gigantenum). The local Manor house is situated in the centre of village and was built by František Koháry in the renaissance-baroque style. It dates from 1720. The English park around the manor house was created by architect H. Nebbien and contains many valuable types of trees such as red oak, chestnut, American nut tree and many others. In 1959 the house has been transformed into the Centre of social services for adults. The village church has always been the centre of religious activities since the 16th century. Veľký Blh was a developed village in the past and had own school, doctor's surgery, craftsmen and farmers. There are 1124 people living in the village at the moment. Village facilities: school, kindergarten, Cultural hall, sporting centre, doctor's surgery, various shops. The gas installation was finished in 2000 and drainage issues should be solved very soon.